A life-long Denverite, Julio can tell you where the 15 meets the 0 and where Celebrity Sports Center used to be. He has a knack of knowing lots of useless facts, which isn’t actually so useless for him since he regularly wins bar tabs at pub quizzes. 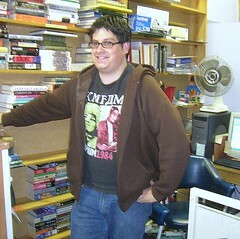 He reads a lot of very random stuff, especially science fiction and nonfiction that doesn’t involve a lot of footnotes. His favorite authors include William Gibson, Neal Stephenson, Donna Tartt, Michael Pollan, and Orson Scott Card. He also enjoys biking, journalism (check out his transit blog RTD Watch), gardening, trying out new foods, outdoor activities and anything involving trivia. This entry was posted in Staff, Uncategorized and tagged bios, Denver, julio, pub quiz, Staff, trivia. Bookmark the permalink.